It's been estimated that mycotoxins infect around 25% of the world's cereal crop. Mycotoxins include over 300 toxic compounds produced when certain molds or fungi infect crops. Aflatoxins are potent mycotoxins that cause liver disease and liver cancer in humans and animals. The molds causing aflatoxin infect cereals and nuts. Aflatoxin is classified into a number of subtypes. The most important ones are B1, B2, G1 and G2. According to the Pakistan study, 41% of breakfast cereal samples were found contaminated with AFs. Of the contaminated samples, 8% were above the European Union's maximum safe levels for total AFs. And 16% were above the EU's limit for AFB1. In fact, unlike most other mycotoxins, there is no tolerable daily intake (TDI) for aflatoxin B1 because it is carcinogenic. The highest levels of AFB1 and total AFs were found in semolina. And just last year the European Food Safety Authority issued a technical report entitled Aflatoxins (sum of B1, B2, G1, G2) in cereals and cereal-derived food products. A total of 2,183 food samples were collected between 2007 and 2012. The EFSA found 10% of the products contained one of the four most common aflatoxins. Of those, 6 cereal and milling products were above the maximum EU limits as were 2 breakfast cereal samples. Aflatoxin was discovered some 30 years ago in England following a poisoning outbreak causing 100,000 turkey deaths. Among mycotoxins known to cause human disease, aflatoxins have been studied most. Ochratoxin A (OTA) is a mycotoxin formed during the storage of crops. Contamination has been reported in cereals, coffee, vine fruits (grapes), and nuts. OTA is toxic to the kidneys (nephrotoxic) and the immune system. It's also been classified as a probable human carcinogen. In the Pakistan study, about 48% of the breakfast cereal samples were found contaminated with OTA. Of those, 30% were found to be above the EU maximum. The highest levels of OTA were also found in semolina products. Zearalenone (ZEA) mycotoxins originate in grains such as corn, barley, oats, wheat, rice and sorghum. [iv] They've even been found in beer. But animal products containing the toxin are also affected. ZEA can be found in grain-fed meat, eggs and dairy products. In Pakistan, 53% of the breakfast cereal samples were found contaminated with ZEA. Of those, 8% were above the permissible EU limit. 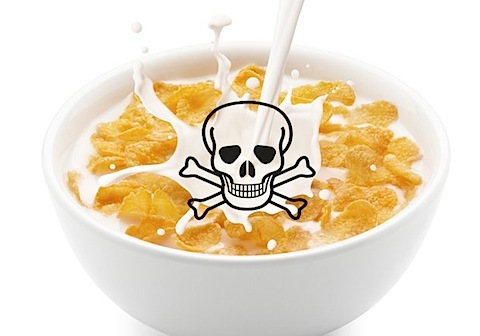 Cornflakes had the highest ZEA contamination levels. A groundbreaking 2011 study found ZEA in the urine of 78.5% of New Jersey girls sampled . The girls (aged 9 and 10 years) who tested positive for the ZEA toxin "tended to be shorter and less likely to have reached the onset of breast development. "[v] The researchers also found an association between the young girls' ZEA urinary levels and their intake of commonly contaminated sources such as beef and popcorn. Research from 30 years ago had shown the estrogenic properties of mycotoxins. Young female piglets fed mycotoxin-contaminated grains showed abnormal sexual development. Mycotoxins form while cereal crops are growing or in post-harvest storage. The contamination is nearly impossible to eliminate. They may not be completely removed by cleaning. And they are not killed during cooking or processing so they frequently make their way into final products. Whether mycotoxins pose a serious health risk depends on how toxic a particular strain is, how much contamination is present, and how much of the contaminated product is consumed. It affects both conventionally grown and organic grains. [vi] And GMO grains may be particularly susceptible. A recent study revealed Roundup herbicide enhances the growth of aflatoxin-producing fungi. It's been suggested that GMOs may be responsible for an alarming increase in fungal toxins in U.S. corn supplies. Reducing mycotoxin risk may require a move away from cereal grains altogether and toward other vegetarian options such as leafy greens. This is a great reason to add healthy seasonings to your cooking. Regular use of herbs and spices may well protect us from a range of dangerous pathogens in the food supply.